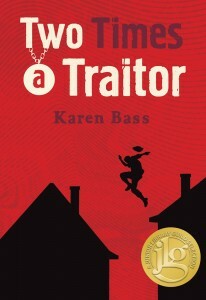 “Two-time winner of the Geoffrey Bilson Award for Historical Fiction for Young People, author Karen Bass follows up Graffiti Knight and Uncertain Soldier with Two Times a Traitor, weaving an exciting tale of adventure, time travel and war, all within a historical perspective. Bass’ writing provides a visceral experience of the events leading up to the Siege of Louisbourg, thrusting Laz into a life completely unknown to him, without technology, clean drinking water or regular bathing. Armed with his parkour skills and a certain knack for getting people to trust him, Laz manages to get by and even thrive under such harsh conditions…. “This is a great story. The historical aspects are really good for middle-grade students. Canadian history isn’t taught as much as it should be in school, so this story would be a great supplement for kids. Though Canada’s 150th anniversary is being celebrated this year, this story demonstrates how Canada’s history goes far beyond 150 years…. “Combining time travel with swash-buckling adventure, Alberta author Karen Bass has written a sure-to-be favourite with middle readers, Two Times a Traitor…. This novel has enough action to suit the most demanding reader….